All groups of Jews in the world are originally from Turkic origin, not only the Ashkenazim. 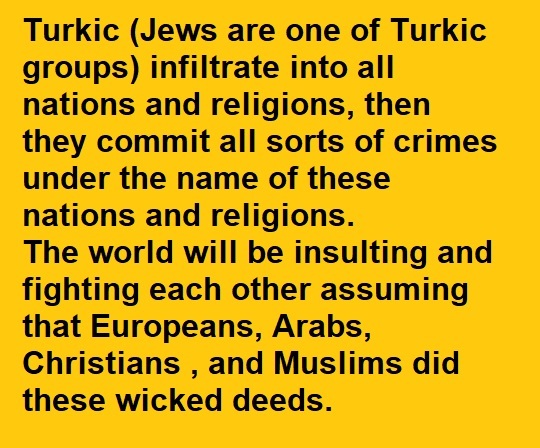 But the Turks are composed of many groups and only one of them is the Jews. The main Jewish groups today are: the Ashkenazim (Eastern Europe), the Sephardim (Western Europe), the Mizrahim (the Arabian Peninsula and Egypt), the Moroccans (North Africa and Gibraltar) and the Indian (India). The first groups of Turk, whose original homeland was Mongolia, consisted of groups of herding nomads and invaders. They are: Azeris, Tatars, Turkmens, Kirghiz, Uighurs, Uzbeks, Kipchaks, Huns, Bulgars, Bashkirs, Khazars, Avers, Meskhets, Kazakhs, the Persians and others. Modern dynastic groups, including Seljuks, Ottomans, Mamluks, Timurid and many others. The children of Israel (Israelite) were an Arab Yemeni tribe that first took refuge in Abyssinia and lived there 430 years (1870 BC – 1440 BC). Some of them infiltrated the Sudan and the rest of Africa and practiced looting and slavery. They caused the collapse of Karma civilization (2,500 BC – 1500 BC). Then one of the kings of Abyssinia decided to expel them and but they fled and returned to Yemen. Then in Yemen Moses received the original Ten Commandments and the Torah in the Ge’ez language of Abyssinia, but they disbelieved and later on forged the Torah. They migrated north to settle there then to invade and occupy Canaan, which was not yet inhabited by Palestinians. All the Israelite from Joseph to Moses, and before them Abraham, never set a foot in the state of Kmt (ancient Egypt) at all. 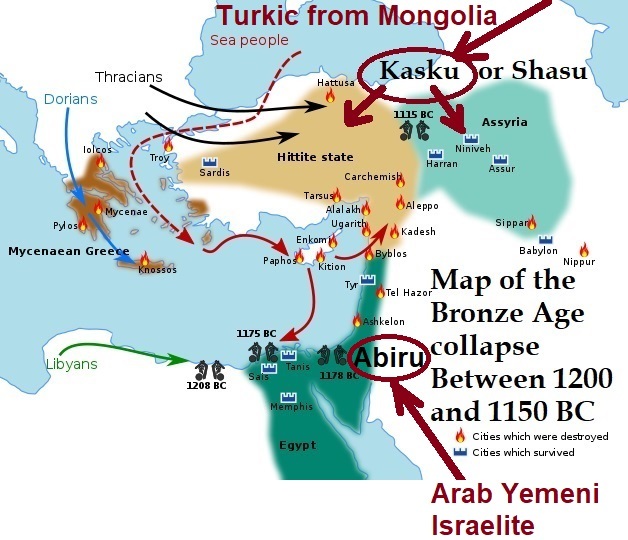 During about two hundred years of subversion (1406 BC- 1240 BC) in the Levant region the Israelite became Hebrew (Abiru), and they came in contact with Turkic Mongolian groups (Shasu), who came from Mongolia by crossing Iran, the Caucasus and Anatolia. 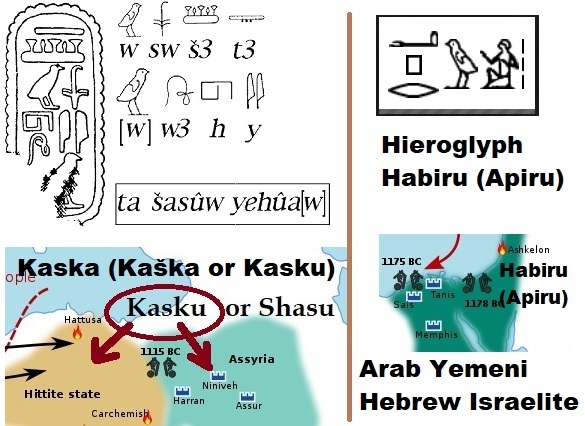 The Arab Hebrew made an alliance with Turkic Mongolians to loot the Assyrian, Iranian and Kamet (Egypt). They agreed to help of the Hebrew to defeat the Canaanites, the conquer Canaan, and in return help the Turks to invade Babylon. Finally, both groups achieved what they wanted. Except for the Yemenite Arab Israelite, Arabs never emigrated or invaded any part of Africa. All those who claim being ethnically Arab in Africa are indeed decedents Turkic Mongolians who settled briefly or crossed the Arabian Peninsula; or from ancient Yemeni Israelite. The religion of the Israelites and the Jews which they call Judaism is not a heavenly religion, but rather an invention and the creation of human beings which has nothing to do with the prophet Moses. Judaism is indeed completely contrary to the Law of Moses and the teachings of all other true messengers of God. As Judaism, or Jewishness, is not a religion it is also not a nationality or an ethnic group, but a political organization that includes all those who are allied with the Turkic Mongolians policies of invasion, looting and settlement in any region of the world. In this reality, Judaism is the first form of Zionism and the former form of the Ottoman policies. In 530 BC, the Judaism sought to settle the Turks, who were mixed their Asian slaves in Canaan, which was occupied by the Israelites since 1406 BC. Equally, Zionism settled the Turks who were mixed their European slaves in occupied Canaan and colonized Americas. Jews passed through three phases since their invention by the Persians in 530 BC through the trick of the return of the Israelites from the Babylonian Exile. The first phase is Persian for the invention of early Jews since in 530 BC and until the Khazars’s entry into the Jewish organization in 720 AD. The second phase of the Jews was dominated by Central Turks and is characterized by various Turks and followed by the Ottoman expansion in the Near East; all Europe; and North Africa and it extended from 720 AD until the end of the English Civil War in 1651 and the emergence of signs of the Zionist organization in 1750. The third phase, which was nearing its end, started in 1651 and escalated sharply in 1750. It is the third stage of Jewish Zionism. The Jewish center of gravity shifted from the Turks and Ottoman colonies to Jewish-controlled Western Europe and the United States of America. The earliest relationships between Jews and Turks aside from the Persian era are found in the processes of decline of the Western and Eastern Roman Empires (400 AD – 1400 AD). In the second half of this period of Roman decline the Imperial-Papacy disputes emerged and the root origins of the Houses of Hanover and Windsor. At the same period the great opportunities of waging Crusades (1095–1291) and (1147–1410) empowered both the Jews and the Turks in many different ways. Many of these Crusades were launched against Christians (Bosnian 1235–1241; Albigensian 1209–1229; Aragonese 1284/5; Despenser’s 1382/3; Hussite 1419–1434). The power structure of Al-Andalus (711-1492 AD), the Ottoman reception of expelled Jews during the Iberian Reconquista (Al-Andalus), Sabbateans, Dönmeh, Frankism, Freemasonry, and the beginnings of Zionism, are all related to each other and all of them plus the organization of first Aliyahs to Israel during the Ottoman occupation show modern connections between Turks and Jews. Another striking modern similarity between the Turks and the Jews is evident in sharing the same hostile stands towards Europeans, Arabs, and Africans. In North and East Africa, both the Turkic Mongolian Jews and the earlier Arab Hebrew Israelites groups, were mainly engaged in looting, slavery, usury, and other businesses that had direct social and political influence in all the areas where they had settled. They have had very destructive effects on culture, society, politics and economy. And the current collapsed situation on all levels in the countries of their presence are the results of those destructive activities of various groups of Turk including Jews. After several decades from the processes of completion of bringing and settling mixed Turks, from all around the world, the state of Israel of 1948 noticed the importance of transferring the left outs and remnants of the Arab Yemeni Israelites from the Arabian Peninsula and Africa. The reason for this late concern is not to settle them in the promised homeland, but to avoid revealing the history of the true Israelites, which is totally contrary to what is stated in their religious and political doctrines and literature. Therefore, these late resettlement operations were considered security necessities and were not religious obligations at all. Additional note on Israelite an Jews in the Sudan: The Jews who came to the Sudan with the Turkish invasion and continued with Mahdism and then the Condominium colonization, as well as those who preceded them after the expulsion of the Jews from Spain (Al-Andalus) were Turkic and not different from the Turks who claim to be part of Islam or Christianity or communism. 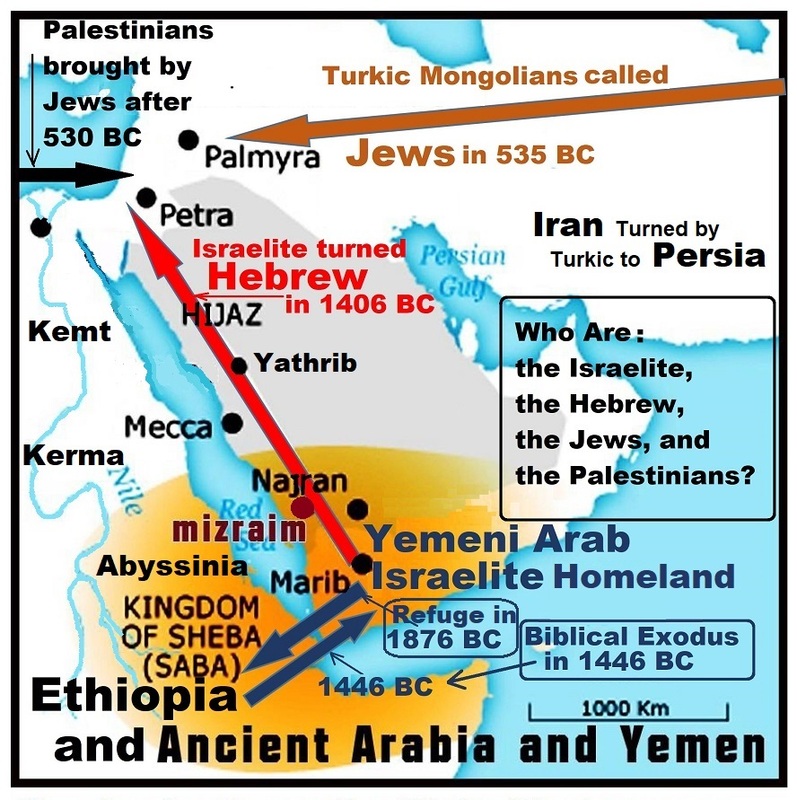 They were quite different from the Arab Yemeni Israelite who later became the Hebrews. These Turks remained with their Tengeri cult and its symbols of crescent and star. The activity of the Jews in the Sudan is a further condemnation added to the series of misdeeds of the Mahdism. There is no justification for any Sudanese to feel nostalgic or proud of those unjust and dark ages. It is also a condemnation of the so-called “national movement”, “political parties” and “era of independence”, which could be described at least as corrupt and failure if we avoid the accusation of collaboration. Caution must be taken towards their agents and their remnants in any country. Today’s “Jews” use the holocaust story as a club to stifle or silence any and all criticism of Jews. Jews are perpetual victims and can never be victimizers. Here is a good article today that debunks the holocaust tale. No doubt “the holocaust” is a hoax made by poor mentality and logic. The whole Jewish history and literature are infested with lies and deceptions since their invention in 530 BC by Turkic Mongolians in Persia. Those Turkic Mongolian groups, and the Jews are one of them, are putting humanity on the defensive all the time while they are the only aggressors on Earth. Humanity and European cannot be hostage to one fake story like this “holocaust”. Enough is enough, Europeans and the world switch to bringing the endless crimes into light. The colonization of the Americas, Asia, and Africa; the Slavery of Asia, Europe, and Africa; organized criminal cartels; debts; usury; destruction of religions; terrorism and many more are indeed Turkic Mongolian (Jewish) mass crimes and they must be charged and condemned. Thank you very much for the link, it is excellent.